Olimp Labs Gold Omega 3 D3+K2 Sport Edition is a dietary supplement with an innovative combination of omega 3 fatty acids, including EPA and DHA, vitamin D3, E and K2, which was derived from soya fermentation. The formula is aimed at promoting normal cardiovascular function and protecting this system and helps maintain healthy bones and organs and speed up post-workout recovery. The product comprises 60 capsules. Eicosapentaenoic acid (EPA) and docosahexaenoic acid (DHA) are fatty acids of the omega-3 family, belonging to a group of essential unsaturated fatty acids (EUFA). The human body cannot synthesise EUFA. Because of that, they should be supplied with a diet due to their important functions. EPA and DHA are used in the body for the synthesis of eicosanoids, among others, prostaglandins, leucotrienes and thromboxanes. These compounds help lower blood pressure, reduce triacylglycerol levels and inhibit some proinflammatory agents, including IL-1. Products of EPA and DHA metabolism show anticoagulant properties owing to, among others, the inhibition of thromboxane A2 synthesis. Omega-3 fatty acids are an important element in the prophylaxis of cardiovascular diseases and support a healthy heart. Regular EPA and DHA supplementation promotes optimal post-workout recovery. Supplementing with omega-3 fatty acids before and after a workout helps reduce DOMS and lower levels of proinflammatory markers. Due to great microdamage in muscle fibers, optimum muscle regeneration after a workout is extremely important for muscle efficiency and training effectiveness. The key role of vitamin D3 is to maintain calcium-phosphate balance, critical to normal bone mineralisation and health. The presence of vitamin D receptors (VDRs) in cells of many organs that are not involved in calcium homeostasis suggests that vitamin D3 has a pleiotropic effect on the body. VDRs were detected in, among others, cells of smooth and striated muscles, the heart, brain and immune system. Vitamin D3 was acknowledged long time ago as a substance with a positive impact on muscle regeneration and potentially the body’s physical performance. Vitamin D3 helps lower the risk of fractures and osteoporosis, thereby preventing or reducing the incidence of injuries. By promoting muscle protein synthesis, this vitamin contributes to an increase in strength of muscle contractions and the body’s physical capacity. Since vitamin D3 regulates the immmune function, it has immunomodulatory properties and boosts the body’s immunity. Furthermore, this vitamin has an anti-inflammatory effect, which may speed up post-workout recovery in combination with omega-3 fatty acids. Vitamin K2 takes part with vitamin D3 in bone mineralisation. Vitamin K is involved in the carboxylation of glutamic acid which leads to the formation of gamma-carboxyglutamic acid (GLA) residues with an affinity for calcium ions. Proteins with these residues are called GLA proteins and include, among others, osteocalcin. By taking part in osteocalcin carboxylation, vitamin K2 contributes to normal bone mineralisation. What is more, it decreases bone resorption by inhibiting the activity of osteoclasts. Furthermore, it promotes, along with vitamin D3, healthy functioning of the nervous system. Numerous observations suggest that vitamin K2 contributes to a reduction in blood vessel calcification. The accumulation of calcium in blood vessels is one of the primary causes of cardiovascular disorders. Calcified blood vessels become stiff and non-elastic which leads to the development of atherosclerosis. By activating matrix Gla proteins (MGP), which prevent calcium accumulation in blood vessels, vitamin K2 has a direct impact on normal calcium balance and makes it possible to store this important element in desirable areas of the body. Vitamin E is a strong lipid-phase antioxidant, thereby protecting sensitive cell membrane phospholipids and polyunsaturated fatty acids (including omega-3) against oxidation. The protection of neuronal membrane against oxidation is one of the mechanisms that prevent neurodegenerative processes and help slow down ageing processes of the body. Vitamin E increases blood vessel elasticity, prevents damage to erythrocytes and reduces blood clotting. This results in better oxygen supply to cells. A deficiency in this vitamin increases the risk of inflammation and cardiovascular diseases, including heart attack. To sum up, Olimp Labs Gold Omega 3 D3+K2 Sport Edition is a dietary supplement recommended especially to athletes and physically active individuals, for the autumn-winter period, a decline in fitness, energy levels and immunity and as a preventive measure to strengthen bones and protect against cardiovascular diseases. 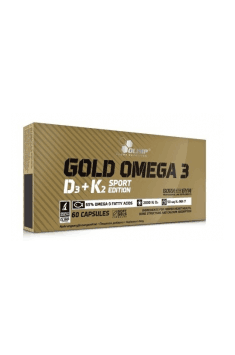 Gold Omega 3 D3+K2 Sport Edition 60 caps. Take 1 capsule a day with plenty of water, after a meal. Vitamin D, E and K found in this product belong to fat-soluble vitamins. Because of that, the supplement should be taken with a fat-containing meal for best absorption. However, due to the content of fish oil in a capsule, in which these vitamins are soluble, it is not necessary. Gelatin, water, glycerol, E 150d.